Gravel riding continues to be one of the most popular forms of riding. Gravel bikes are fun to ride on the pavement and are even more fun to ride on the dirt. The possibilities of where to ride become endless with this style of bike. 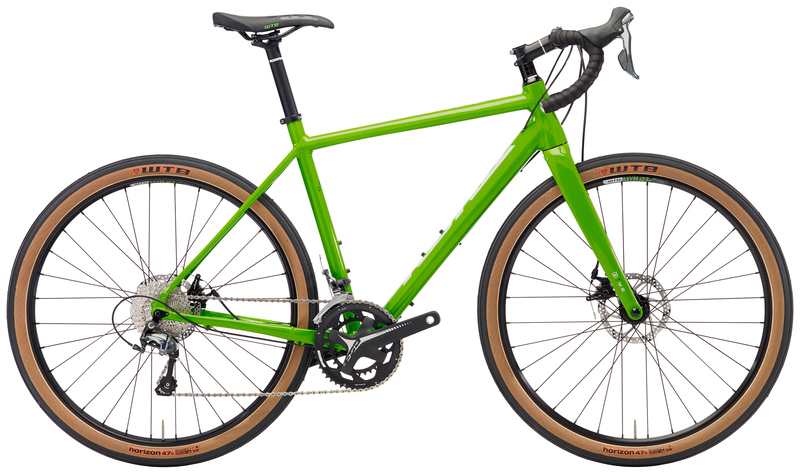 The 2018 Kona Rove NRB Bike is a gravel bike that has an aluminum butted frame, disc brakes, and thru-axles. The bike comes with 650b wheels but can also use 700c wheels for commuting. The fork is full carbon fiber and helps reduce the vibrations from the pavement or gravel. The Rove NRB comes with a Shimano Tiagra 2x10 drivetrain. This includes a Shimano Tiagra front derailleur, rear derailleur, shifters, and cassette. The cassette has an 11-34 tooth gear range which provides excellent climbing gears for those tougher hills and terrain. It features TRP Spyre C Flat Mount mechanical disc brakes which are simple to adjust and maintain and provide excellent braking power. It also has WTB Asym i23 TCS rims that are paired with WTB Horizon Road Plus TSC 650c47c tires. The tires and rims are tubeless ready so you can drop the tire pressure down for a smoother ride and better traction. If you're looking for a fun gravel bike that you can ride anywhere on, then you'll love the 2018 Kona Rove NRB Bike. Comfortable, capable, well thought out bike with a smart value-oriented spec designed for real world riding. Expertly assembled and very safely packed for shipping. I’m very satisfied with machine! I don’t know how Road Plus will be seen years from now, but I really like it. I’m not looking back. I've only taken it for a short ride, but so far so good. I've envied the 650B wheels on my wife's Dr Dew for some time. These are significantly more comfortable than my other bike's 700c 32mm wheels and, they take quite a bit of the harshness out of the road. That said, had I purchased this at full price, I'd give it 4/5* because of value. The lack of hydraulic brakes is unfortunate IMO. Especially since, Kona's equally priced Jake the snake has them equipped. The brakes on this bike aren't bad, and should improve as the pads bed, but they are definitely lacking compared to the hydraulics I have on my commencal city bike. My First Gravel Bike....Love it! I was looking for a bike that I could ride on a lot of different roads, gravel, canal tow paths and well there are a lot of choices out there! I really wanted cushy wide tires to smooth out gravel, rough roads, etc. my test ride confirmed everything I was hoping for. Just need to get everything dialed in. I never bought a bike online before but the Jenson staff answered all of my questions. and it took literally 10 minutes to put it together. It took 10 minutes because I've never used a through axle (Haven bought a bike in years...still used to QRs lol). I wouldn't hesitate to buy another bike from Jenson. Looking forward to doing some long multi-path "adventure rides on this thing! What is the weight of the bike as described? The photos don't show any rear rack mounting points on the seat stays, but there are rack mounting points next to the rear dropouts. Does this bike come with rack mounting points on the seat stays? This model has rack/fender mounts built in between the seat and chain stays. You will want to ensure that your rack model can utilize that style of mount. Hope that helps!